It was no surprise that celebrations for the 2007 United Nations World Environment Day (WED) on the 5th of June happened to be in Tromsø, Norway. This year, in support of the International Polar Year (IPY) 2007-08, the WED focused on the effects that climate change is having on polar ecosystems and communities, and the consequences it could have for the rest of the planet. World Environment Day is commemorated each year on the 5th of June and is one of the principal vehicles through which the United Nations raises worldwide awareness of the environment, aiming to draw political attention and to stimulate action. Activities included a scientific conference on climate change at Tromsø University. Speakers at the launch of the WED included United Nations Environment Program (UNEP) Executive Director and UN Under-Secretary General Achim Steiner, who stressed that changing snow and ice conditions affect everyone on the planet, that mitigating the effects of climate change would cost only 0.1 % of GDP per year, and that political action is the only missing element keeping necessary measures from being taken. Norway's Environment Minister Helen Bjoerney also spoke, stating that finding ways to limit average global temperature rise to 2°C should be a goal for future commitments under the United Nations Framework Convention on Climate Change (UNFCCC), which will be holding its climate change conference in Bali in December 2007, and hoped that an international agreement on global emissions reductions could be agreed to by 2009. World Environment Day Celebrations coincided with the release of UNEP's report, The Global Outlook for Ice and Snow. UNEP and a network of about 70 of the world's finest experts compiled the report in support of the IPY. The peer-reviewed report builds on the findings of the IPCC's Fourth Assessment Report released earlier this year and draws attention to certain areas in which more scientific clarity is needed. The report discusses the effects that climate change induced declines in snow cover, sea ice, glaciers, permafrost and lake ice will have on billions of people not only in the Arctic but also across the planet. A reduction in snow cover and glacier mass will imply a decrease in the availability of water for drinking and agriculture, creating shortages of water and negatively impacting the winter tourism industry. The rapidly melting snow and ice will also pose a threat of avalanches and flash floods. Sea levels would rise 4 to 5 m even if only 20% of the Greenland ice cap and 5% of the Antarctic ice sheet were to melt away. Without adaptation measures, even a rise of 1 metre would expose some 145 million people, particularly in Asia, to flooding, and cost 0 billion in damage. Having a better understanding of the rate at which ice caps and ice sheets are melting is an area that needs more research within the IPY. The report predicts an ice-free Arctic Ocean in summer by 2100, however abrupt changes could bring about this situation even sooner. Sea ice cover is also expected to decrease significantly in the Antarctic as well. Increased opportunities in shipping and natural resource exploitation will have impacts on northern communities. 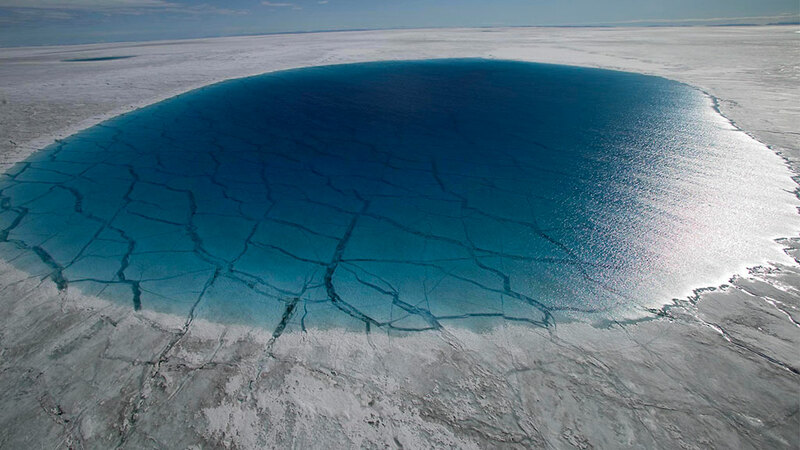 Melting permafrost in sub-arctic regions of the planet will not only have the potential to damage buildings, roads, and railways as subsidence occurs, but it also will create thermokast lakes and release large amounts of the greenhouse gas methane into the atmosphere in the process. The disappearance of snow and ice over land and water overall increases the rate of warming. This is because bare land and sea absorb more solar radiation than ice and snow, creating a positive feedback that accelerates warming over time. This might one day trigger abrupt and more rapid climatic changes with ever graver and more widespread impacts on human societies, economies, and wildlife. Although some countries have begun to take adaptation measures, the report points out that poorer parts of the world lack financial resources and technology that can help them to adapt, and that many parts of the world are ill-prepared for the rate at which climate change will take place. Political action is the only missing element keeping necessary measures from being taken.